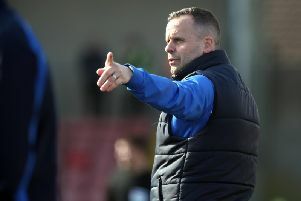 Coleraine boss Oran Kearney is hoping for positive news about Ian Parkhill’s injury this week. The in-form wide man was stretchered off in the first half against Dungannon Swifts on Saturday following a clash with Dougie Wilson. Initial fears were the Ballymoney man had suffered a serious injury. But Parkhill was able to leave The Showgrounds after the game unaided. “Parky seems not too bad he is able to put a bit of weight on it, but we’ll monitor the next 48 hours with him,” said Kearney. Kearney also revealed the club has received positive news about Brad Lyons, who picked up a knee injury in the cup win over Tobermore United last Saturday. And Eoin Bradley was able to take part in some non-contact sessions with the rest of the team last week. “Brad has a medial knee ligament strain and is looking at a couple of weeks out. We feared the worst at the start and thought it might be six or eight weeks, but the way he has come through the last few days he’s feeling a lot better,” said Kearney. “He should have the brace off this weekend and we’ll have him back cycling and jogging during the week. “As I said the problem with Skinner is putting the reins on him. “He did bits and pieces of the session on Thursday night, I made it non-contact for his benefit. “But with a break in a bone it still has to be six weeks to let it heal properly. One man who has made a successful return from injury is James McLaughlin. The big striker has had a frustrating time with injury this season, but he has come back with two goals in his last three games. On Saturday he combined with Gareth McConaghie to score the winner for the Bannsiders. “It has been a frustrating season for James, he has had a few injuries so it has been a bit stop start,” said Kearney. “James knows where the back of the net is. “It was a great ball by Gareth McConaghie, James has a sixth sense, he knows exactly where the keeper is going and he gets a lovely touch on the ball to send it into the net. Coleraine have no game this week, but they will take a squad to Maginn Park in Buncrana on Friday night for a friendly with Derry City. “We will train on Tuesday and have Thursday off and the guys who need games will play on Friday night. “But there’s a few guys there who are carrying we knocks and they will do a wee bit on Tuesday night and then have a full week’s rest,” added Kearney.